Ausgangspunkt des Projektes EXIT St. Pankraz ist die Untersuchung der wirtschaftlichen Entwicklung entlang einer signifikanten Geländekante an der B138, einer der wichtigsten transnationalen und transalpinen Nord-Südverbindungen: der umgangssprachlich als „Gastarbeiterroute“ benannten Strecke von Holland und Deutschland in die Nachfolgestaaten Jugoslawiens und in die Türkei. Vom landwirtschaftlich geprägten Gasthaus über einen Schnell-Imbiss hin zur 24-Stunden-Autobahn-Raststation mit multinationaler Belegschaft erweiterte sich Jahrzehnt für Jahrzehnt der geografische und wirtschaftliche Einzugsbereich des Unternehmens im Gleichschritt mit Straßenbau und Autobahneröffnung. Mehrmals wurden Workshops organisiert. 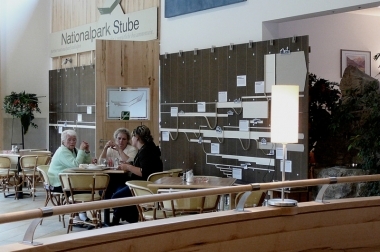 Eine auf der Raststätte eingerichtete ‚Materialsammelstelle‘ diente dabei als Display für das eingebrachte Material und als räumliches Set für die Treffen. Das besondere Augenmerk des Projekts liegt auf der Geschichte des Unternehmens als Kreuzungspunkt von Einheimischen und Menschen verschiedenster Nationalitäten. Ehemalige und derzeitige Mitarbeiter und Mitarbeiterinnen, Geschäftspartner und Geschäftspartnerinnen und Gäste der Raststation wurden eingeladen, Fotos, Objekte und Erzählungen einzubringen, die dann für die Ausstellung übersetzt wurden. Diese Recherchen werden nun im Rahmen des Projektes in zwei Teilen präsentiert: zum einen im Inneren der Raststation St. Pankraz in Form eines Panoramas der betriebsgeschichtlichen Fluchtwege und Sackgassen der Unternehmerfamilie. 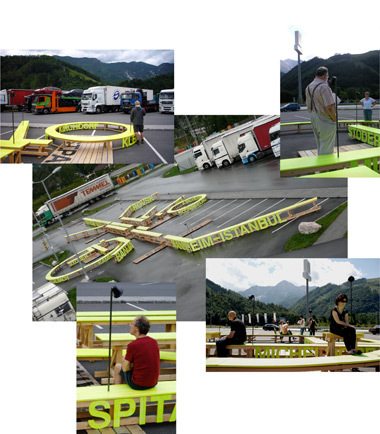 Und zum anderen direkt auf dem Parkplatz der Raststation in Form einer 40 Meter langen 3-dimensionalen begehbaren Audio-Installation, die ein abstrahiertes Wegediagramm von 12 ausgewählten Akteuren unterschiedlicher Nationalitäten darstellt, die diese Raststätte aus durchaus abweichenden Gründen frequentieren – oder die an ihr einen vorläufigen Endpunkt ihrer Fluchtwege gefunden haben. Wie Verkehrsmeldungen werden deren Erfahrungen über Lautsprecher mitgeteilt und dadurch indirekt mit lokaler Betriebsgeschichte und überregionalen politischen Veränderungen vernetzt. Während der Laufzeit des Festivals haben drei geführte Wanderungen mit dem Projektteam durch in die Wirtschafts- und Sozialgeschichte der unmittelbaren Umgebung und entlang der topografischen Kante um die Autohahnraststätte das Programm ergänzt. Contribution for the ‘Festival der Regionen 2007’ Fluchtwege und Sackgassen – Exits and Dead Ends. 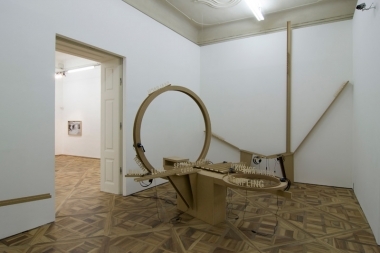 This work was prompted by a competition associated with the Festival of Regions and having both target region and theme predetermined: with the title “Fluchtwege und Sackgassen” [Exits and Dead Ends], the invitation solicited artistic projects relating to locations in a specific region, namely the district of Kirchdorf an der Krems in Upper Austria. This formerly primarily rural, middle-class region is wedged in a tributary valley on the edge of the Alps in a kind of dead end. Yet, because of post-war commercial development with ever-increasing traffic, extension of the road network and the construction of a tunnel at the end of the valley, the region has been gradually transformed into one of the most important trans-national and trans-Alpine north-south connections in Europe. A route known colloquially as the “Gastarbeiterroute” [guest worker route] stretching from Holland and Germany to the states of former Yugoslavia and Turkey. 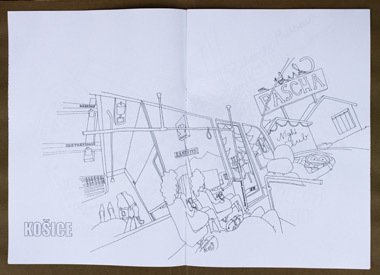 In this project too, the choice of location to be the actual subject of investigation is justified in part by the autobiographical qualification of those conducting the research. One member of the project team grew up in this district, whilst the others had vivid memories of this section of road as a result of their own commuting experience; on their journeys they regularly stopped at the significant change of gradient there, whether because of a tailback caused by the steep gradient, perhaps in response to the catering on offer at the old inn at the lowest point, maybe because of the beautiful view at the snack stand on the large bend in the road or due to the fuel station at the top of the slope. By way of a strategic entry point for the project, a proposal was presented to the head of the business and family with a view to compiling a history of the family business empire and exhibiting it in the service area in the form of a business panorama. This proposal had the effect of increasing the operating family’s willingness not only to disclose details of its history but also to involve staff, partners in business and regular customers. 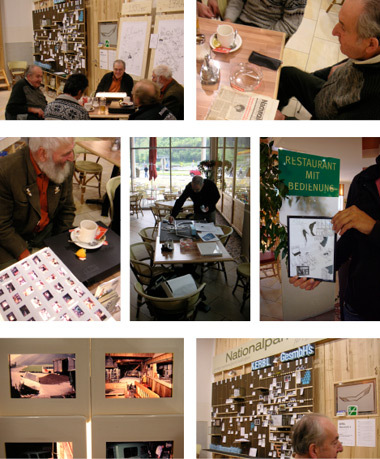 These people were invited to workshops at the service area and, in exchange for comics we had drawn, they brought along photos, objects and recollections relating to the history of the business, which were ultimately converted into the business panorama. Nevertheless, the focus of the project was not concentrated solely on the history of the business as perceived by stakeholders with a strong social link to it, but also on the service area’s role as a stopping point and intersection for trans-national traffic. So, over a period of one year, we drove the 250 km from Vienna to the service area a total of 11 times for two days each in order not only to interview the staff and regular customers but also to observe and ask questions of other parties who stopped there in the course of their travels. The business panorama inside the service area was depicted as a timeline, beginning in 1939 with the purchase of the first farm and inn, then a growing number of staff and the expansion (and splitting up) of operations leading up to bankruptcy proceedings in 2005. In addition, notable events linked to politics beyond the region and local business developments were integrated on the diagram in the form of newspaper reproductions of newsflashes. 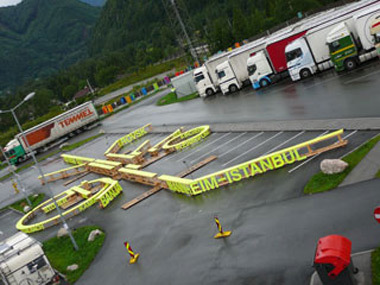 But the actual installation stood for 3 weeks right in the service area parking lot: it is a route network diagram, 40 m long and 12 m wide, depicting in abstract form the paths followed by 12 characters who pass through the service area on their journeys, stop here following various rhythms or work here. The installation consists of a simple supporting frame of unplaned spruce battens to which are screwed MDF boards painted dayglo yellow-green. Also painted this colour are the cut-out letters forming the sections of text terminating the abstract paths to mark the destinations of each character: Istanbul and Mannheim for example. The long, linear paths depict the routes of former guest worker families, lorry drivers and migrant labourers in relation to the service area, whilst the shorter, circular ones are those of local service providers. The paths are interrupted three times by wooden platforms. The outer two represent other important stopping points and network intersections, service areas in Nuremberg and Belgrade. The third platform, around which all paths are concentrated, marks the St. Pankraz service area. 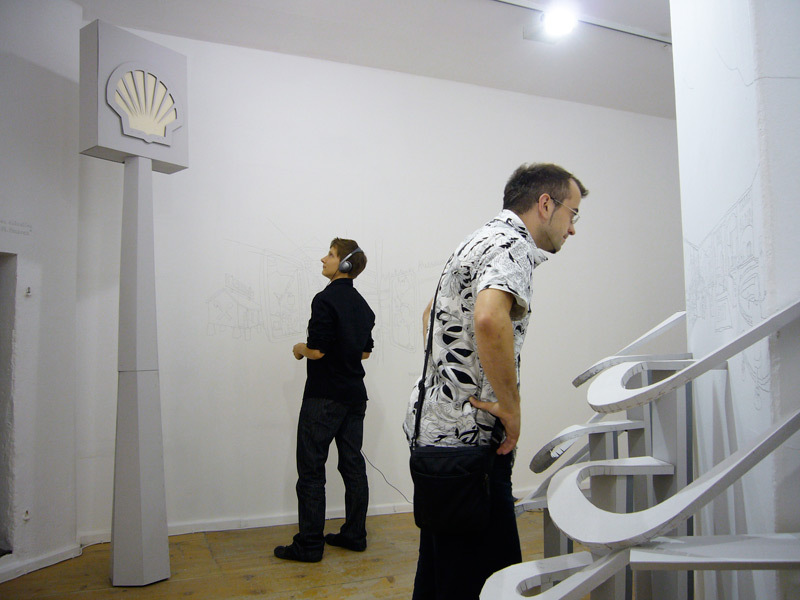 Each path has a built-in audio channel: by means of external loudspeakers attached to a steel pole above the visitors’ head level, an audio track lasting two to three minutes runs in a loop, recounting the relevant character’s experiences in condensed form. What one hears though are not recordings of the interviewees but instead accounts spoken in a neutral reporting style by newsreaders, each preceded by a beep reminiscent of a traffic announcement. The open ends of the extensive installation invite users of the parking area to walk between and through the paths depicted. Their lower-lying components towards the outside are at seat height whilst the higher, inner ones are at table height, with the result that the entire installation can also be used as furniture. 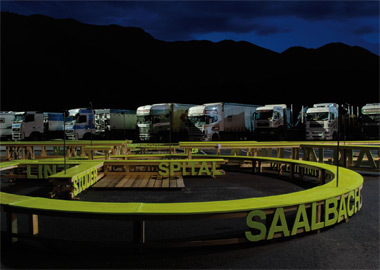 Moreover, given that there is no seating provision at the service area (outside the dining areas), the installation met with ready acceptance. Furthermore, the for us surprisingly high level of visitors’ identification with the city names led to a group of Slovakian lorry drivers using the area round “Kosice” as a bar for a whole night and a group of German-Turkish guest worker families favouring the “Istanbul” text as a particularly attractive focal point for their evening prayers. Walking tours: guided tours with the project team through the commercial and social history of the immediate environment along the topographic edge around the service area completed the programme.